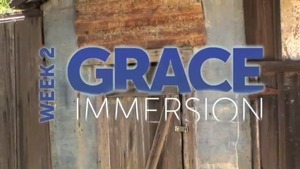 In the first week of Grace Immersion you saw how Jesus taught against performance-driven religion at every turn. But then yesterday you saw this teaching in danger of being lost almost immediately as the early church drifted back to legalism. So God raised up a very unusual man to protect this legacy: a Pharisee, of all people, named Saul — a guy who had been absolutely opposed to the Christians until his sudden conversion. His named changed to Paul, this former teacher of religious law became the unlikeliest champion of grace! In fact you could call Paul the Apostle of Grace. Of the 155 times the New Testament uses the word grace, 133 are found in his writings. Grace opens his letters, grace closes his letters, and grace is the point of everything in between. Paul enthusiastically makes one point over and over again in his biblical writings: Grace alone is, was, and always will be the basis of our relationship with God. This exact confusion was happening even in the churches Paul helped start. As he says in today’s verses, he is “astonished” that the Galatians are “so quickly deserting” the grace of Christ and turning to a different gospel. As he adds, it’s really “no gospel at all” because gospel means good news, and it’s not good news to hear that you have to work your way to heaven! So what happened to the Galatians? Some teachers came along and taught a doctrine you could label Christ Plus: Jesus died for your sins, but now there are a bunch of extra religious hoops for you to jump through. You might be forgiven by God’s grace, but you continue on from there with your own hard work. This subtle and insidious teaching poisons the minds of many Christians today, just as it did in Paul’s day. I beg to differ. In my observation, many, if not most, of the Christians I know have some concept of grace in their heads, but it hasn’t really moved to their hearts. They still feel condemned at times by God; they still suspect their performance earns them more of God’s love; they only think of grace as what saved them, but now their hard work does the rest. In fact, for them the gospel has been perverted into something that really is not gospel at all. It’s interesting that Paul opens most of his letters with the phrase “grace and peace to you.” When you get grace, really understand it, you also experience peace, real peace, deep down in your soul. So how’s your peace level? As you continue this Grace Immersion with a look at how Paul clarifies and champions the concept of grace, I know you’ll find your peace level growing! How does an understanding of grace lead to peace? Do you think some of the lack of peace you may be experiencing is tied to a lack of understanding about grace? 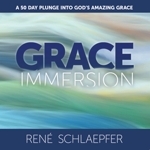 Ask God to help you see the full, dynamic, outrageous truth of the gospel of grace during this Grace Immersion. Ask God to deliver you from a watered-down grace or grace mixed with human messages.